Days two and three ended up being the last days of QUILTED in Poland. But once I relate the events of those days, there is still an awful lot to tell. QUILTED has continued and just keeps going and going. On the morning of Day two, I was very excited. What was I most excited about? My own sewing and continuing it. But I was also really excited to continue getting to know the other women who had started squares. The day would end up being a very quiet one. Jessica and Teresa had ZBF responsibilities that kept them from even stopping by for a moment to visit. Iva and Alicja had volunteering responsibilities that came first, and I completely understood. Anna was participating in another workshop, which was taking place at the same time. All of my original compatriots were already accounted for and no new ones appeared to participate. A group of Italians did arrive in search of their accommodations and I invited them to return for the third day of the workshop, but they had to go attend to their rehearsal space. I spent the three hours that morning sewing and drinking tea and reflecting. It was the first time in a long time that I had really taken some time for myself. I enjoyed the quiet and the peace and the "work" of my sewing. 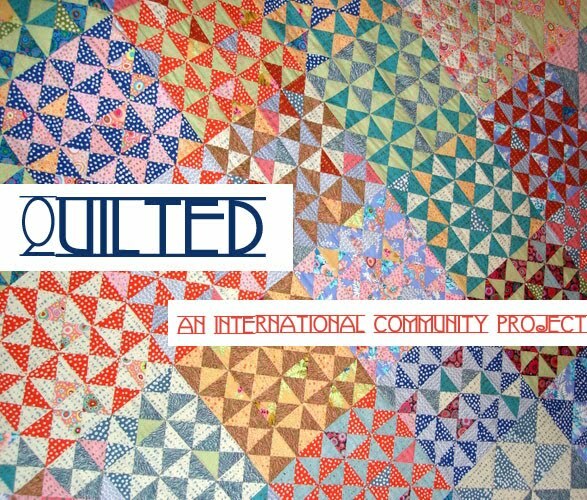 The experience of QUILTED in two days had already shown me how important taking such time is for the individual. Later that day, I met the group that was visiting from Belgium: Pietro, Sarah, and Saskia (I apologize as I know their names are not spelled correctly). Pietro had read about my workshop and wanted to know if he could attend for a moment or two on the last day. While the idea of a male participant or viewer was not originally part of the workshop's intent, I felt that the evolution of the project was more important than attempting to retain the women-only clause so I told Pietro he could come in the last thirty minutes of the workshop. What surprised me though, was the arrival of Sarah and Saskia at 10am sharp the following morning. Saskia was thrilled to participate and Sarah was a little less so, but seemed to enjoy piecing her square together once she started. Also sewing that morning were the volunteer Iva, and an employee of the Institut, Bieta. She is an older woman and had expressed interest in the workshop to me earlier in the week when the Open Program had been practicing and performing in one of the Institut's off-site venues. On the first morning of the workshop, Bieta came in and shyly told me that she wouldn't be able to stay as she had a lot of work to do. But she asked if she could pick out some fabric in order to start work on a square. Then the members of Open Program told me that she would work on her square while they rehearsed. To them, she seemed happy, at ease and a little calmer while she worked. This didn't surprise me as I had found that sitting down to sew was changing my own mood and place in time as well. So Bieta managed to find some time to participate with us that Saturday morning. She was going to sew with us and then continue all of the duties and responsibilities she usually dealt with on her one day off a week. The Belgians were so much fun and Saskia and Iva began a beautifully rich conversation, switching from English to French in certain moments. Saskia was so excited about the project and jumped right into the creation of her quilt square. Sarah was fascinating to watch. She had some idea, but when we asked her what she was doing, she couldn't really speak about it. She found more excitement in the composing of her square and once she realized she only had an hour left, she wistfully turned to the sewing of her creation. I soon found out why she had been ill at ease about the sewing...she had a very hard time threading her needle and so I spent the last hour helping her do this task several times, as she wanted to change the color of her thread often. I can still feel the gentleness of this act, even now, five and a half months later. There was such a tender, quiet exchange as I threaded Sarah's needle. It was as if she became a child and I became her elder. I can't think of other times that such a role reversal has ever occurred and I think it is these quiet little moments that I was writing about in my proposal. I had been curious about what kind of exchanges would occur among women in an intimate, multi-generational setting and here was yet another peek into those mysteries. Bieta also asked me to thread her needle once she saw that Sarah was not at all timid about asking me. And just when we were into the full swing of our time together - having experienced both moments of complete quiet and concentration as everyone worked at their squares and moments of loud chatter as we drank tea and laughed and joked - Pietro entered the scene. This kind, respectful, thoughtful artist himself entered so quietly that at first we didn't notice him. But he quietly greeted us and Saskia and Sarah showed him what they had been working on. Sarah left her square to be finished by me, since her favorite part had been composing it and not sewing it. Saskia wasn't ready to relinquish her square though. She took it with her and since she was scheduled to leave the following day, I saw her working on it two or three more times throughout the day. She left it wrapped in a note on the pillow of a fellow Festival-goer who gave it to me after she had left. While that was supposed to be the last day of the workshop, there ended up being one more worth relating. But first! Photos from Day three!